Schaffhausen town/(city) is the capitol of the canton/(state) of the northernmost part of Switzerland. Germany undercuts the western part of the canton, almost separating it from the remainder of Switzerland. 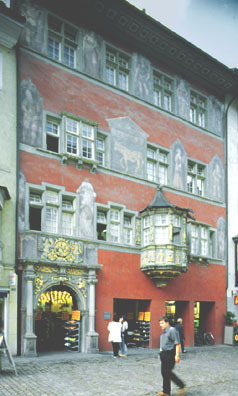 If one drives the direct old route to Zürich, one has to cross into and out of Germany on the way between Schaffhausen and the commercial capitol of the country. Yes, there are border guards and stops on all main highways crossing the Swiss-German border. Schaffnausen (town) is known for what, in America, we call "bay windows." There are also the painted walls of buildings. 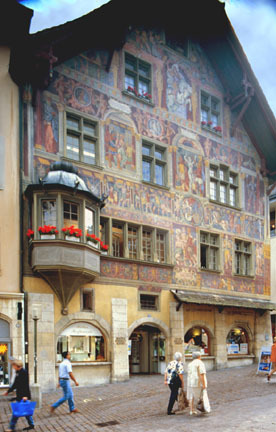 It is a good place to shop; outside of Geneva, Schaffhausen is the center for watch production. On the main north-south pedestrian walkway. Inside, a pub for Falkenbier. The "Munot" is known around Europe. Hard to describe, but a walk up the hill to its position, safe from attack, will explain all. View is from the left/south bank of the Rhine, east of the express route to Zürich. Originally the town was a portage place for traffic on the Rhine, for just south of the town is the largest waterfall in Europe. Technically the falls are in the charming town of Neuhausen-am-Rheinfall. The Rhinefalls are beautiful year-round, for they change with the seasons. All views are from the Hotel Bellevue which, on my last visit the summer of 1999, was closed "for renovations." This web site is copyright © MMII William Allin Storrer.